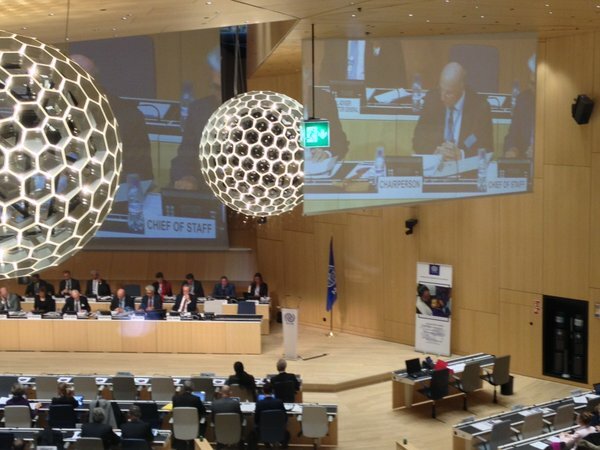 Switzerland - IOM’s 106th Council, which opens today, will this week consider applications for IOM membership from five States – the Democratic Republic of São Tomé and Príncipe, the Federation of Saint Kitts and Nevis, the Republic of Kiribati, the State of Eritrea and Saint Lucia. IOM is currently comprised of 157 Member States. Four of the five applicants for IOM membership in 2015 are island nations impacted by rising sea levels due to global warming – a growing concern for IOM and other agencies concerned with environmental migration. The fifth applicant, Eritrea, is one of Africa’s largest senders of migrants and refugees to Europe. Nearly 80,000 Eritreans have arrived in Italy by boat in the past two years. On Wednesday, 25 November, Anote Tong, President of the Republic of Kiribati, will deliver a keynote address to the three-day Council, which is being held at the World Intellectual Property Organization (WIPO)’s new conference hall in Geneva. The Council also will host a high level panel, “Migration, Human Mobility and Global Health: a Matter for Diplomacy and Inter-sector Partnership,” moderated by IOM Director General William Lacy Swing. - Dr. Margaret Chan, Director General, World Health Organization. - Madina Rahman, Deputy Minister II of Health and Sanitation, Ministry of Health and Sanitation, Republic of Sierra Leone. - Ioannis Baskozos, Secretary General of Public Health, Greece. - Ambassador Päivi Kairamo, Ambassador and Permanent Representative, Permanent Mission of Finland to the United Nations Office in Geneva. - Chaisiri Anamarn, Advisor to the Minister of Foreign Affairs, Thailand. - Xavier Prats Monné, Director General, Directorate-General for Health and Food Safety, European Commission. Other speakers at the 2015 Council will include: Kelly T. Clements, Deputy High Commissioner, Office of the United Nations High Commissioner for Refugees; Hesham Youssef, Assistant Secretary-General for Humanitarian Affairs, Organization of Islamic Cooperation; Jeremy Konyndyk, Director, Office of US Foreign Disaster Assistance; John Ging, Director, Operational Division, United Nations Office for the Coordination of Humanitarian Affairs; David Donoghue, Permanent Representative of Ireland to the United Nations; Claire Melamed, Director, Growth, Poverty and Inequality Programme, Overseas Development Institute; Gibril Faal, Director, Africa-Europe Diaspora Development Platform (ADEPT), and Paul Ladd, Director, United Nations Research Institute for Social Development.